Yesterday our family had a funeral for my father, John P. Rowley, who had passed away earlier in the week. We ended up having a wake for the immediate and extended family on Friday evening, and then for my father’s various colleagues, friends, acquaintances, we had a visitation on Saturday afternoon. One of the regrets I have had is that I never wrote down my father’s stories from the various stages of his life from childhood, to when he was a soldier during the Korean War, and then afterwards as he started his career as a journalist and then ended up having two additional careers, one as a public relations manager for the United Way group of charities in Chicago, and in retirement as head of a charity called NAMI (National Alliance for the Mentally Ill). As a family man, he ended up having five children, of whom I am the second in order. The stories he would tell, especially those of his early life before I even existed, were the ones that I grew more and more interested in as time went on. At the funeral however, the people that came in to pay their respects to my father and his family didn’t come in linear order based on what chapter of my father’s life it was when they met him and interacted with him. There were people from all of his 89 years who came and went throughout the wake and then the visitation. As I was thinking about the wonderful pageant of people who paraded through the funeral parlor this weekend, I realized it was probably easier to describe their interactions with my father not as a series of chapters, but as a series of concentric circles representing what part of my father’s life they had interaction with. The above diagram is an adaptation of one I use when teaching about project management to represent the various levels of stakeholders of a project. A stakeholder is one who can impact a project or one who can be impacted by the results of a project. If you take my father’s life as a “project” In a loose way, then the stakeholders of the project known as my father’s life fall into several categories. It’s in describing these that you end up getting a fuller, more dimensional picture of my father than the linear description of his life found in the funeral notice which I posted in the previous post. Of course, my father started life as the child of his own father, and the fact that he had an older sister and a younger brother shaped the course of his life. His sister Mary and he were very intelligent and very good in school, and they both had a lifelong love of learning that never let them. My father’s father died in my father’s childhood, and so in a way my father always had an awareness of the absence of his father, as if he had been, in his own way, abandoned by him. This made him determined to stick around and be supportive of his own children. Interesting enough, my mother had also been abandoned by one of her parents, in her case her mother, who left what we might call today an abusive relationship when the children were about junior high or high school age. Again, like my father, this made her determined to stick around and be supportive of her own children, and my brothers, my sister and I were the beneficiaries of this determination. My father’s mother ended up being embittered by the straitened circumstances that her husband’s death left them in, and here again, my father decided not to be like his parent, and ended up having a cheerful disposition which also remained with him to the end of his days. Here, too, I can say we were the positive beneficiaries of this personality trait of my father’s. When my older brother and I lost our jobs in 2010 in the midst of the economic recession that choked off the careers of many people here in the U.S. at that time, we were determined to get back into the work force, and we were both successful. I know I can speak for my brother in saying that we credit this success to a large extent to that basic disposition of determination and positivity that we inherited from our father. My father had three careers, from 1948-1968 as a newspaper reporter, which he preferred to the more modern term of “journalist.” He had a curiosity about the cultures, peoples, and countries of the world which never left him. In the last year of his life, he discovered a program called “International Mysteries”, on one of the obscure international channels that came with our cable TV package, which showcased a new mystery story every Sunday evening from a different country in Europe. It was his way of vicariously traveling, and he enjoyed the program tremendously. As a reporter, he was very cynical about politicians, but very tenderhearted and compassionate towards ordinary people, as evidenced by his next two careers working with charities. He left the Sun-Times newspaper in 1968 around the time that Rupert Murdoch bought the paper, because he saw the “handwriting on the wall” about what direction the paper was going to be taken, namely, sharply to the right. However, he found a new career in public relations. As he explained to me, “in a crisis, I know how to handle reporters because I was one once myself!” After a brief stint in an educational publishing company called Science Research Associates, he joined the United Way of Chicago and worked there from 1972-1992. He loved helping charities manage their resources and leverage the media to get the word out about the work they were doing to serve people in the city of Chicago and surrounding suburbs. And finally, after he retired from United Way, he started exploring working with various charities as a volunteer, and finally ended up working for the South Suburbs of Chicago chapter of the National Alliance for the Mentally Ill, an advocacy group that supports those who have a mentally ill or family members who are caring for someone who has a mental illness. He ended up being the President of the local chapter of that organization and retired from that position in 2007. At the funeral, no one from his first career as a reporter was there at the funeral, but those who knew him in his second career as a public relations manager for United Way, and his third “career” as a public relations manager and then President of NAMI of Chicago South Suburbs, came to the funeral and it was gratifying to hear their stories and their gratitude for my Dad’s stewardship of those organizations. In World War II, my father tried to enter the Army in 1944 when he turned 18, but was turned down by the medical board as “4F” because of the medical condition of having a perforated eardrum, which left my father more highly prone to infections. He moved to Washington, D.C. and decided to help the war effort by working in the Department of the Navy. Now in 1950, during the Korean War, he was called up but his ear condition but no longer an impediment to service in the army due to advances in handling infections through the use of sulfa drugs. However, the fact that he knew German to a certain extent by having studied it in his last year in high school, meant that he was sent to Germany rather than to Korea. His favorite line for serving his army service was “I fought Communism from the basement of a Bierstude in Berlin.” Actually, he served as the public relations department of the army due to his two years of experience at the Sun Times newspaper in Chicago as a reporter. He was always interested in books, TV programs, and films about World War II. He felt proud of his service in the Army, but he felt a little abashed at the fact that he never played a large part in either World War II or the Korean War due to circumstances beyond his control. My father was a lifelong Democrat politically and his worldview was definitely of an liberal and international bent, something which all of his children have inherited. In fact, when I became 18 he gave me a copy of Saul Alinsky’s Rules for Radicals, because he wanted to see my rebellious nature to be channeled into a constructive rather than destructive frame of mind. The reason why he gave me that book was because he knew Prof. Alinsky at the University of Chicago where my father initiated but never completed Master’s level studies in Economics. I know that if he hadn’t had so many children, he probably would have gone on to at least the Master’s level if not higher, because of his love of learning. When I went on to get a Master’s Degree in Asian Studies from the University of Illinois in Urbana-Champaign in 1990, he made sure to be there at my graduation to tell me how proud he was that I had achieved what he had been unable to do in his own life. The liberal and international views that he believed could be described as one which believed in the positive role of government to be the neutral arbiter of various groups in society, and on the world stage, where our country should lead by promoting international cooperation and diplomacy as tools that should be used first before the military option was tried. He was increasingly cynical about politics towards the end of his life, although he remained optimistic about people’s ability to help others at the local level through organizations such as the charities he worked for during the last three decades of his life. Until the final week of his life, my father read a physical newspaper over breakfast and coffee, which shows that the habits of a lifetime were hard to break. Although he did have a computer and used it for sending e-mails, looking up information, etc., he never liked reading books from a Kindle or getting his news from online blogs. For him, a newspaper had a physical and mental weight to it that its digital version could never have in his eyes. He was a “traditionalist” in that sense, if you want to give a label his generation that was born up until 1945. However, unlike many his generation, he liked interacting with others in the next generations, and loved the fact that he was surrounded by neighbors who had kids. He loved the “joyful noise” they made of playing or even sometimes fighting with each other or arguing with their parents, because it took him back to his life as a parent and his earlier life as a child. 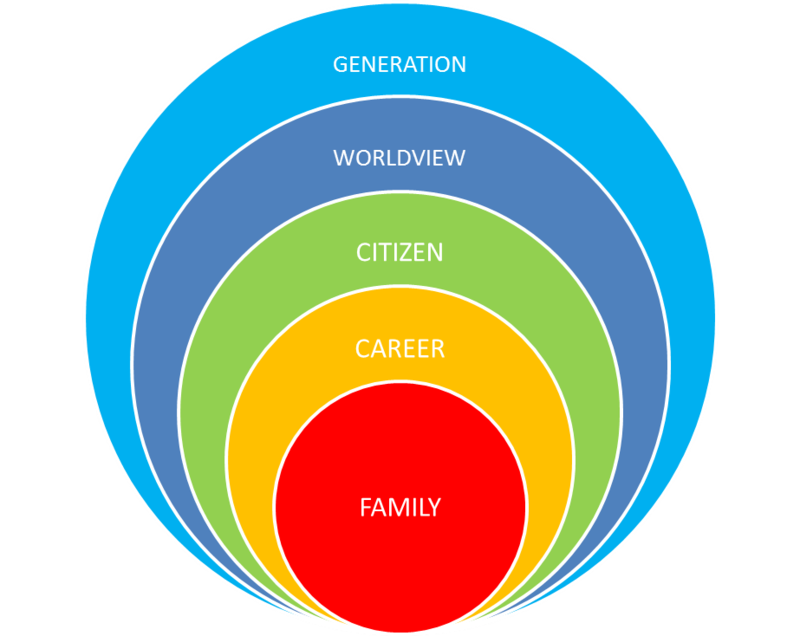 In short, the various circles of stakeholders my father was a member of all made him a part of who he was. He felt that it was the privilege of a lifetime to be who he was, when he was living, and where he was living, and this attitude of gratitude, that life is a gift, is something he took with him to the end. And that is why I truly feel, from my perspective, that it was a privilege of a lifetime to be his son.